Macro Express modules are powerful tools to create a completely new and custom-made interface and command structure for any module of ScorBox. They are easily created, modified, and shared. Just about any programming language could be employed for this task; Macro Express was chosen because it enables the average user to create new modules, or to revise existing ones, with relative ease, and then to share such modules with the community. If you are uncertain about working within ScorBox, you may want to try the concept out at first, by installing Macro Express and working with it for free during the trial period granted by Macro Express. You will need to install Macro Express Pro. As of this writing, the most recent version is Macro Express Pro, ver. 4.6.0.1. To view further information on the Macro Express website, click here; once you are ready to purchase, you can do so from here. 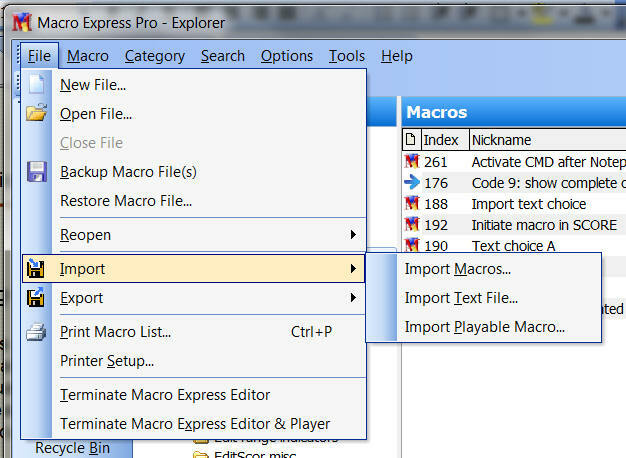 Note that “Import” files may contain one or more macros: an entire group of macros, such the the “Required Macros” import file on this site, can be imported at once into Macro Express. Each contributor should adhere to this organizational structure (note that this list will grow and be revised). When submitting a new macro, comment the macro thoroughly and, on the notes tab of the macro, provide a detailed description of what the macro does, how to implement it, and where in the above organizational scheme to position it. Then, if desired, you may modify, expand, abbreviate, etc. the respective file to suit your particular needs. It is also possible that you will arrive at a better algorithm. If so, you may want to consider sharing your improvement with the community on ScorBox.com.